The Cleveland Pops Orchestra plays its remake of the Cleveland Browns Fight Song, September, 2011. POPS composer and arranger Paul Ferguson made the new arrangement of the 1946 fight song, along with four other versions in different musical styles. POPS Board member George Veras, President of Veras Communications, produced and directed the video. 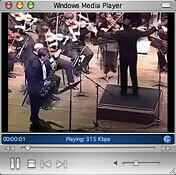 Click the links below to watch videos in WMV format. Click the play button to sample all selections, or click on the track of your choice. Sound and video files are provided for your personal listening pleasure. By law, you are not permitted to retransmit, record, modify or redistribute these files in any way without written permission from the Cleveland Pops Orchestra.